About Spa And Sauna Co. Locations – South Virginia St. Swim spas are growing in popularity, and the reason is simple. These big pools in small packages fit easily into most backyard spaces, providing the power and punch of a full-sized pool. 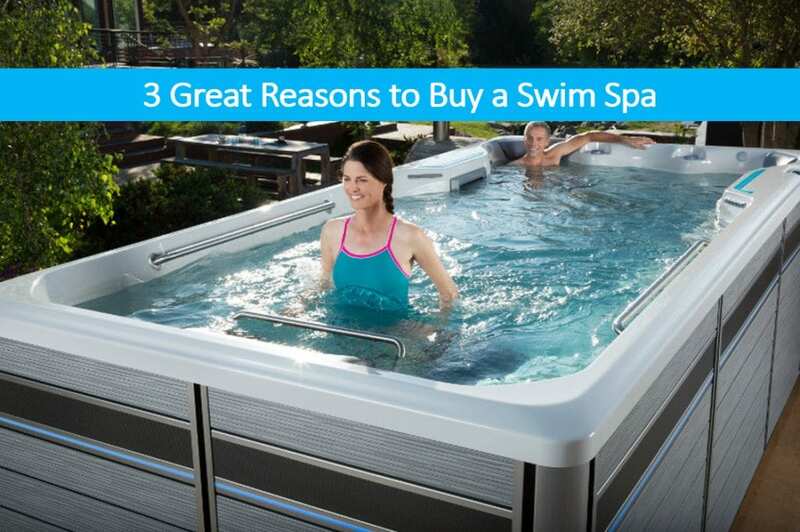 Here are three reasons to buy a swim spa for the backyard. Swim spas have more power than their bigger, yard-swallowing counterparts, but can fit into almost any space. They take far less electricity to run, and require very little maintenance to keep the water sparkling clean and clear. A swim spa at home offers low-impact, highly effective exercise opportunities for all ages. In addition to swimming laps, exciting features like an underwater treadmill, rowing station or support handles make aerobic exercise underwater fun. The natural buoyancy of water helps you recover from injuries, while working muscles with low impact swimming and movement that strengthens and tones. The spa side of the swim spa offers warmth and massaging relief, working out muscle tension. So Go Ahead, Take a Swim, You Deserve It! It’s, fast, fun and relaxing. Not only that, it’s good for the body, soothes the mind and can improve your overall health and well-being. To encourage local residents to check out the benefits of using a swim spa to help improve their overall health and well-being, The Spa and Sauna Company is providing free swim spa test soaks at all their showrooms. We do recommend, however, that people wanting to schedule their free 30-minute test call us ahead of time to reserve their spot. To learn more about the benefits of owning a swim spa, just give us a call at ☎ 775-852-3838 or visit our website at: https://www.spaandsauna.com/endless-pools-fitness-systems. The Spa and Sauna Co. The Spa and Sauna Co. provides all your backyard leisure products from 5 convenient locations. Not sure which store to visit? Click below to see what each offers. 1002 S De Anza Blvd. The Spa and Sauna Co. is a Premier Caldera, Hot Spring, Freeflow and Sundance Spas Dealer. We Sell and Service New and Used Hot Tubs, Portable Spas, Swim Spas, Saunas, Pool Tables, Accessories and More. Serving Reno, Sparks, Truckee, South Lake Tahoe, Fallon, Fernley, Lovelock, Zephyr Cove and Winnemucca. Also serving Santa Cruz, San Jose, Cupertino, Los Altos, Sunnyvale, Palo Alto, Santa Clara, Los Gatos, Saratoga, Campbell, Menlo Park, Atherton, Stanford, Woodside, Portola Valley, Redwood City, Corralitos, Watsonville, Aptos, Seascape, Scott’s Valley, Ben Lomond, Felton, Boulder Creek, and portions of the following: Davenport, Fremont, Milpitas, Gilroy, Morgan Hill.